What is a VeggieTales Mom, you say? 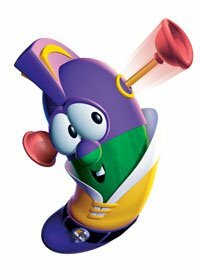 VeggieTales Moms is the first direct selling company in America that is entirely focused on promoting a life-changing, biblically based message among children—that God made each child special, and loves them very much. By connecting children to VeggieTales' engaging characters, VeggieTales Moms will be helping families. Our award-winning DVDs and dynamic books and music can inspire an attitude change, character growth, or even an introduction to God! We are excited to be sharing this opportunity with you. With us, you’ll find a simple, fun business—one that you can make a light-hearted “hobby work” or something that helps support your needs year-round. So are you enjoying your new Job? Looks like fun.